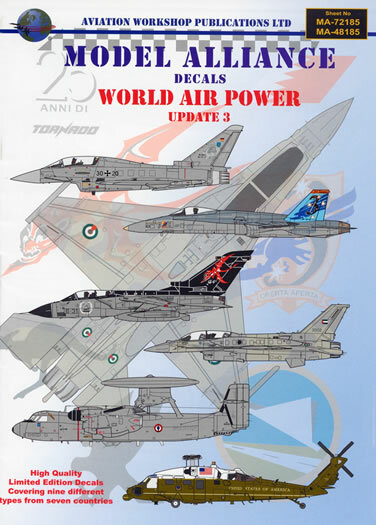 MA-48185 World Air Power Update 3 from Model Alliance Decals is a mixed sheet in that it provides markings for 13 different aircraft operated by seven different countries. 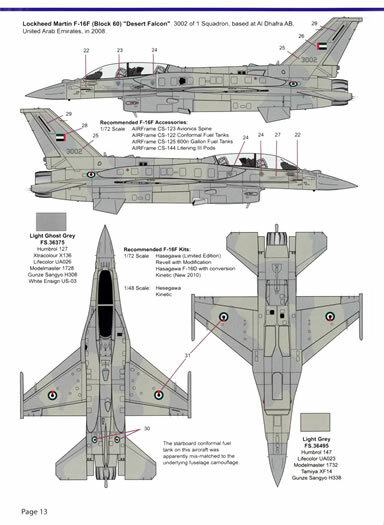 General Dynamics F-16C, (Block 40) 115 (formally 90-0035) of 1 Squadron Royal Bahraini Air Force based at Sheikh Isa Air Base, Bahrain in 2008. The machine is in an overall camouflage scheme of a mixture of FS 35237 blue grey and FS 36622 light grey with a FS 36270 neutral grey nose cone. Apart from the national insignia and squadron markings you also get a limited assortment of stencil data and “slime lights”. 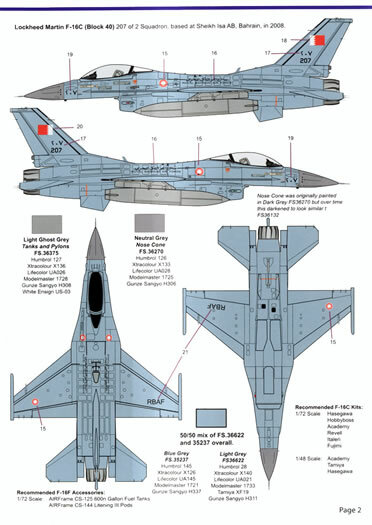 Lockheed Martin F-16C, (Block 40) 207 of 2 Squadron Royal Bahraini Air Force, based at Sheikh Isa Air Base, Bahrain in 2008. This option is also finished in an overall camouflage scheme of a mixture of FS 35237 blue grey and FS 36622 light grey with a FS 36270 neutral grey nose cone. Panavia Tornado Interdictor/Strike fighter-bomber (IDS) Mid Life Upgrade (MLU), MM7006 of 6 Stormo, 154 Gruppo, Aeronautica Militare, based at Brescia-Ghedi Air Base, Italy in 2007/08. 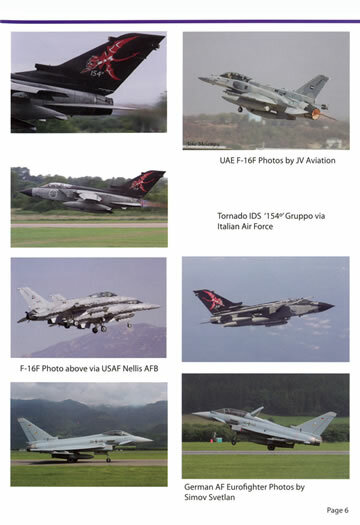 The supplied markings depict the aircraft when it was specially decorated to celebrate the 25th anniversary of Tornado operations with 154 Gruppo. The machine is finished in overall FS 36280 neutral grey with the nose cone, fuselage spine and vertical stabiliser/rudder in black. 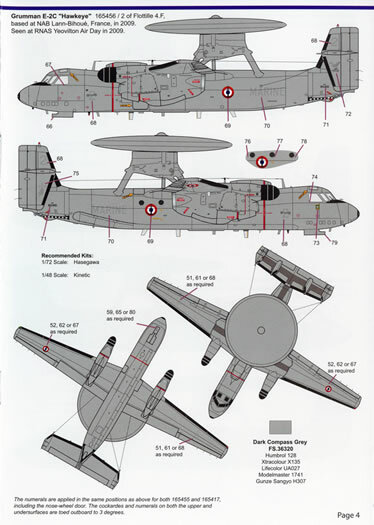 Grumman E-2C Hawkeye 165455/1 of Flottille 4.F,Aéronavale based at NAB Lann-Bihoué, France, in 2008. This option and the next two are essentially the same with just squadron insignia, individual aircraft number and serials to differentiate between them. All three machines are finished in overall FS36320 dark compass grey. You get a separate set of national insignificant for each option. 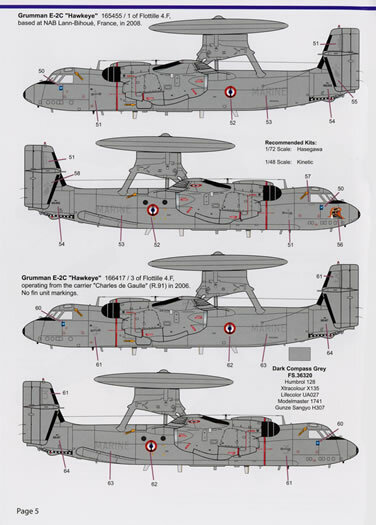 Grumman E-2C Hawkeye 165456/2 of Flottille 4.F, based at NAB Lann-Bihoué France, in 2009. 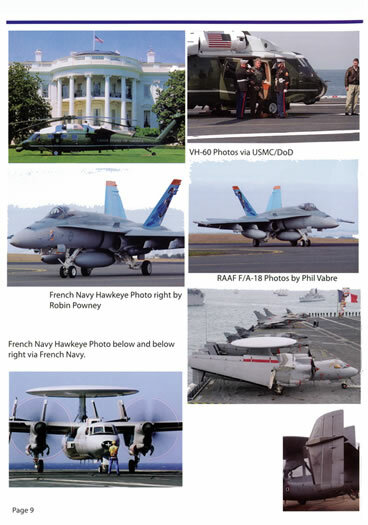 Grumman E-2C Hawkeye 166417/3 of Flottille 4.F, operating from the carrier Charles de Gaulle in 2006. 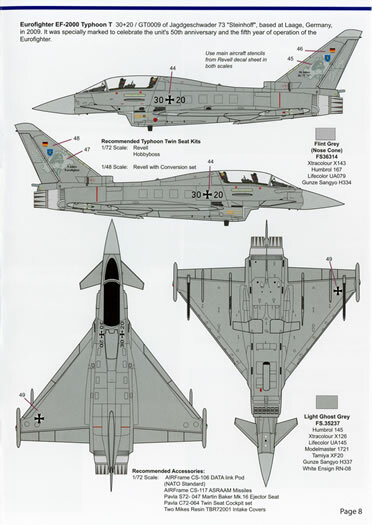 Eurofighter EF-2000 Typhoon T, GT0008, 30+17, of the Deutsche Luftwaffe’s Jagdgeschwader 73 Steinhoff, based at Laage, Germany in 2008. 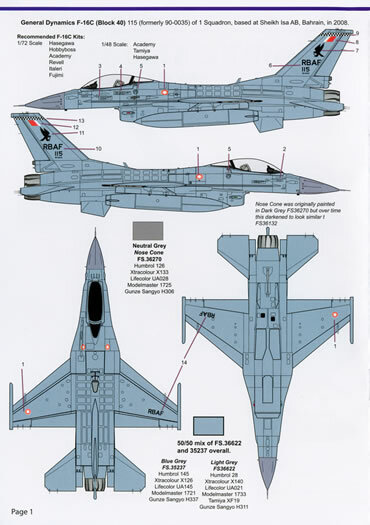 The accompanying placement guide advises the machine is finished in overall FS 35237 light ghost grey with a FS 36314 flint grey nose cone. There are four of these machines featured on the sheet and each is provided with a separate set of national insignia. 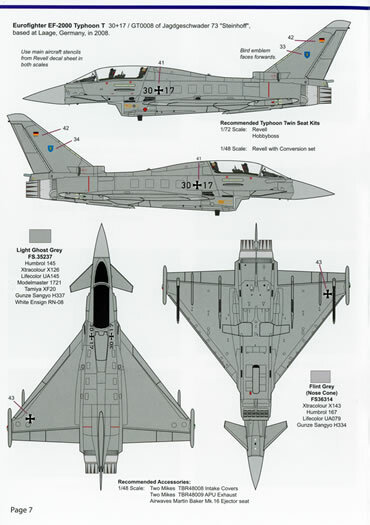 Eurofighter EF-2000 Typhoon T, GT0009, 30+20 of Jagdgeschwader 73 Steinhoff, based at Laage, Germany 2009. The machine is wearing artwork on its tail to celebrate the unit's 50th anniversary and the fifth year of operation of the Eurofighter. The accompanying placement guide advises the machine is finished in overall FS 35237 light ghost grey with a FS 36314 flint grey nose cone. Eurofighter EF-2000 Typhoon S, GS0021, 30+33 of the Deutsche Luftwaffe’s Jagdgeschwader 74, based at Neuburg, Germany in 2008. 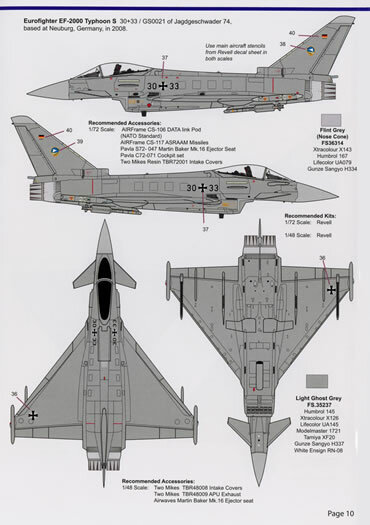 The accompanying placement guide advises the machine is finished in overall FS 35237 light ghost grey with a FS 36314 flint grey nose cone. 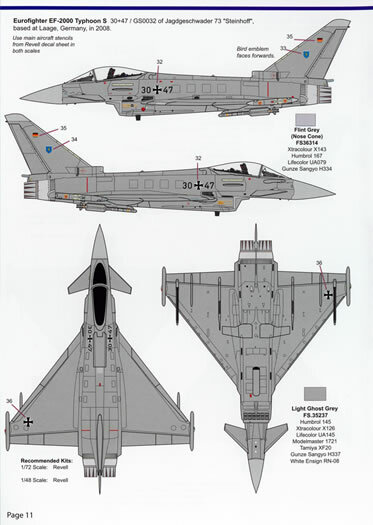 Eurofighter EF-2000 Typhoon S, GS0032, 30+47 of the Deutsche Luftwaffe’s Jagdgeschwader 73 Steinhoff, based at Laage, Germany 2008. 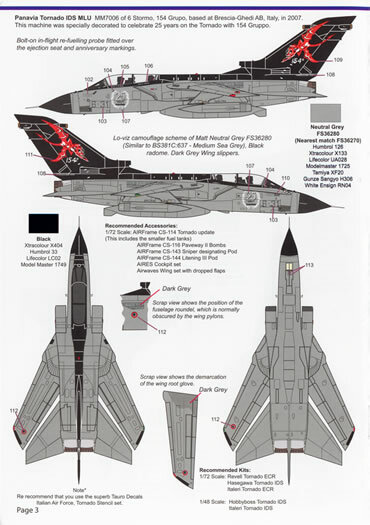 The accompanying placement guide advises the machine is finished in overall FS 35237 light ghost grey with a FS 36314 flint grey nose cone. 3 Squadron Royal Australian Air Force (RAAF), based at RAAF Williamtown, New South Wales circa 2006/07. The aircraft wears special markings to commemorate 90 years of service (1916-2006) by 3 Squadron. It wears nose art as well as some spectacular markings on the outer faces of its vertical stabilisers. The machine is in the standard scheme of FS 35237 blue grey over FS 36375 light ghost grey with its vertical stabilisers in light blue with its fin caps in orange. Apart from the squadron markings you also get national insignia, “slime lights” and a limited assortment of stencil data. Lockheed Martin F-16F "Desert Falcon", 302 of 1 Squadron, United Arab Emirates Air Force, based at Al Dhafra Air Base, United Arab Emirates in 2008/09. The machine is finished in a disruptive camouflage scheme of FS 36375 light ghost grey and FS 36495 light grey. This option also comes with a limited assortment of stencil data and “slime lights”. Sikorski VH-60N Whitehawk, 163266 of the Executive Flight Detachment of HMX-1, based at Marine Corps Air Facility Quantico, Virginia in 2008. The machine is finished FS 14079 “Presidential Olive Green” with a FS 17875 Juneau White top to its fuselage. 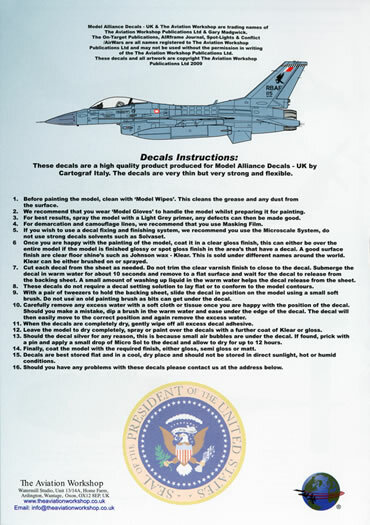 All the white pin-striping worn by the machine is supplied as decals as is the national insignia, Seal of the President of the United States, and the US flags. The decals themselves are very good quality indeed and have been produced using the silk screen method by Cartograf. They are thin and glossy and have very little carrier film surrounding them. 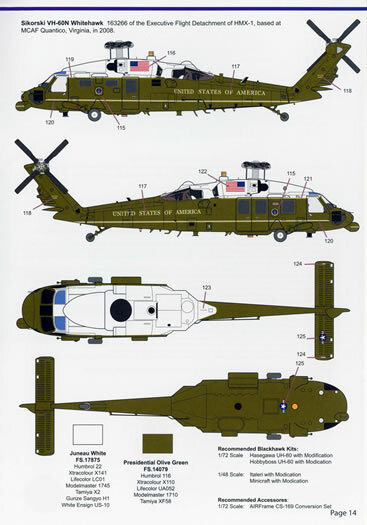 The register is spot on including all the intricate Seal of the President of the United States markings worn by the Sikorski VH-60N Whitehawk option. The sheet itself is very large indeed measuring roughly 8½" wide x 12½" high (215mm wide x 318mm high). The placement guide comes in the form of an eight page booklet (5¾" wide x 8¼" high) that provides a separate page for each option. 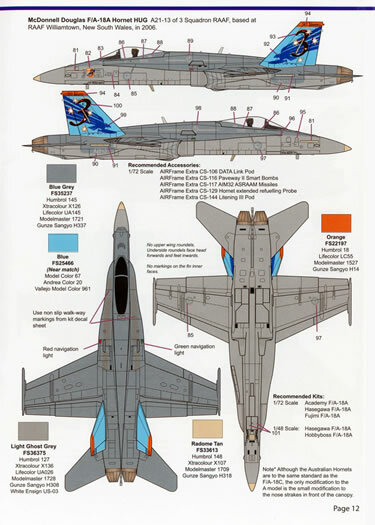 Each page holds four view full colour illustrations of each machine as well as information as to what kits are available of the machine in both 1/72 and 1/48 scales. Matches to readily available model paints – Humbrol, Xtracolour, xtracrylic, Lifecolour, Model Master, and Alclad and a list of applicable AIRFrame Extra after-market accessories are also provided. The decals sheet and the placement guide booklet come packed in a clear plastic zip-loc bag. 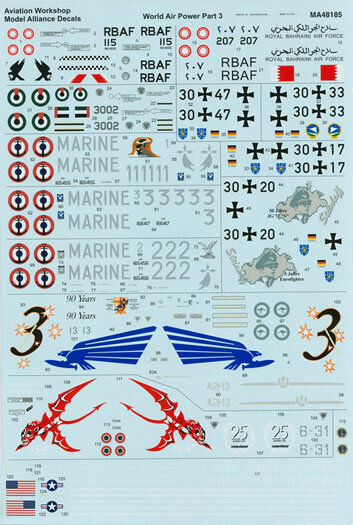 All up an excellent sheet from Model Alliance Decals. It supplies you with a very wide range of subjects as well as first rate decals and support material.